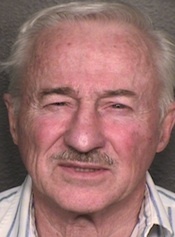 GREELEY, Colo. – Today in Weld County District Court, Joseph Losinski (DOB 5/13/39) pleaded guilty to poisoning and killing his neighbor’s two dogs. Losinski pleaded guilty to one count of aggravated cruelty to animals, a class-six felony, and one count of intimidating a victim or witness, a class-four felony. He faces up to 7.5 years in the Department of Corrections when he is sentenced on Dec. 12. According to police and court records, Losinski laced meat with strychnine, a powerful poison, and fed the meat to his neighbor’s two dogs. The animals, a German shepherd named Kyera, and a chocolate lab named Dozer Boy, both died. Later, Losinski sent an intimidating letter to a neighbor who was a witness in the case. The U.S. Environmental Protection Agency was involved in the investigation due to strychnine being a controlled poison that requires special permits to possess. Deputy District Attorney Jennifer Hill prosecuted the case. Site contents copyright © 2019 Recorder Online	except as noted. All rights reserved. | 90 queries in 2.158 seconds.